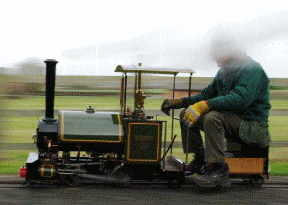 Every third Sunday of the month, members of the Melton Mowbray and District Model Engineering Society, model enthusiasts and the public can see the engines and locomotives in action at Whissendine Sports Club and the public can ride them. There are typically about 30 people, old and young, at these monthly steam-ups, with a few engines in steam as well as some diesel locomotives. All are welcome!